Thanks to warmer fall temperatures and moist soils, the fall colors at Elcona are quite vibrant and beautiful this year. The maples, sassafras, and burning bushes on property have an especially showy red this year. Even the tulip trees have gotten into the act, showing a vibrant yellow this year. They also have begun dropping at a frequent pace thanks to a couple of hard frosts and freezes. 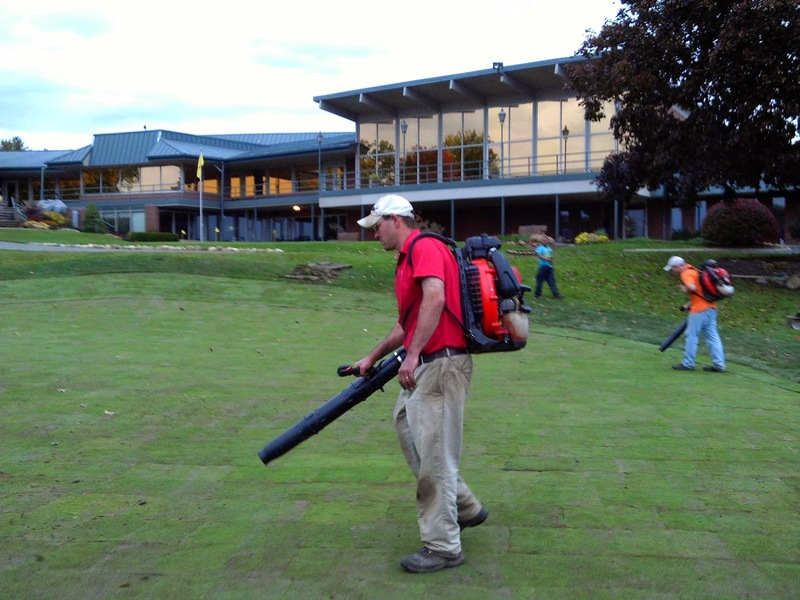 Our blowers and mulching mowers will continue this never ending battle until mid-November, and we will do our best to clear main playing surfaces as the weather will allow us to. As our schedule allows, we have been solid-tining the rough around the greens and the entrance/exit areas around cart paths. These 1/2″ holes serve to relieve compaction from foot and machine traffic, and allow for new growth for both roots and shoots. 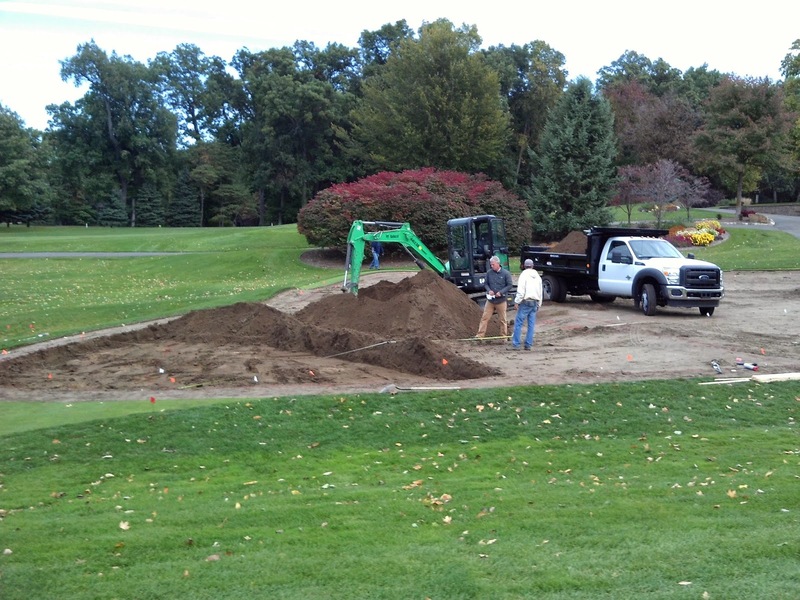 This is another step in our goal of improving the density around the greens, providing better playability. These holes should not impede your play, but you may notice them in thinner areas around the green. Raising mower heights. When the weather forecasts dictate a prolonged cold snap, I will raise the height of cut on greens from the normal height of .120″ to .135″. 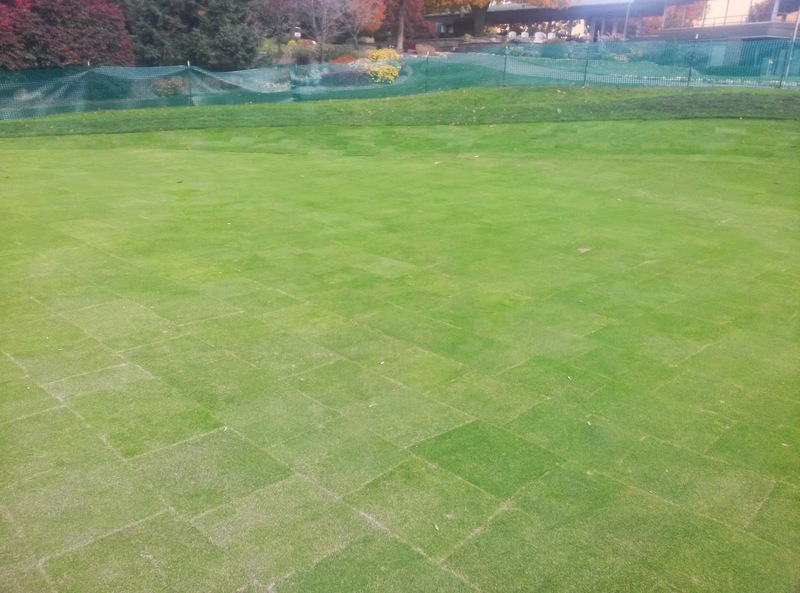 Raising height of cut allows more leaf surface for the turf to maximize their photosynthetic capabilities and carbohydrate storage. Raising height will also lessen stress to the plant and create a deeper root system going into winter. To keep green speed at an acceptable level when this is done, we will be rolling more frequently. While raising heights may not create the speeds that summer brings, it is best for the long term health of the greens going into winter. Aerification. 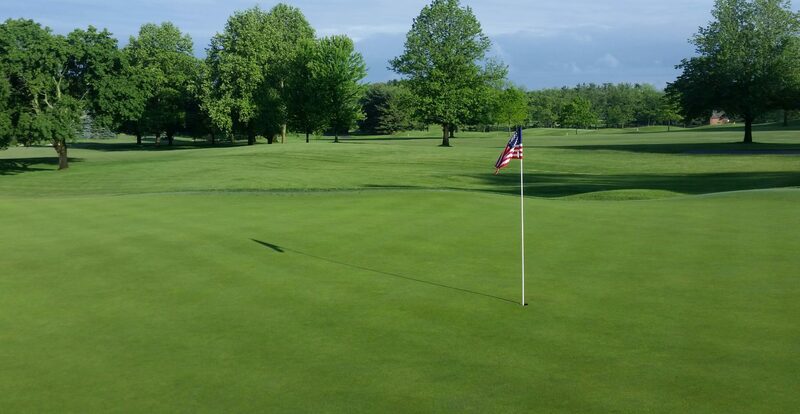 On November 3rd, we have a contractor coming in to perform solid tine aerification to a depth of 12″ on all greens. 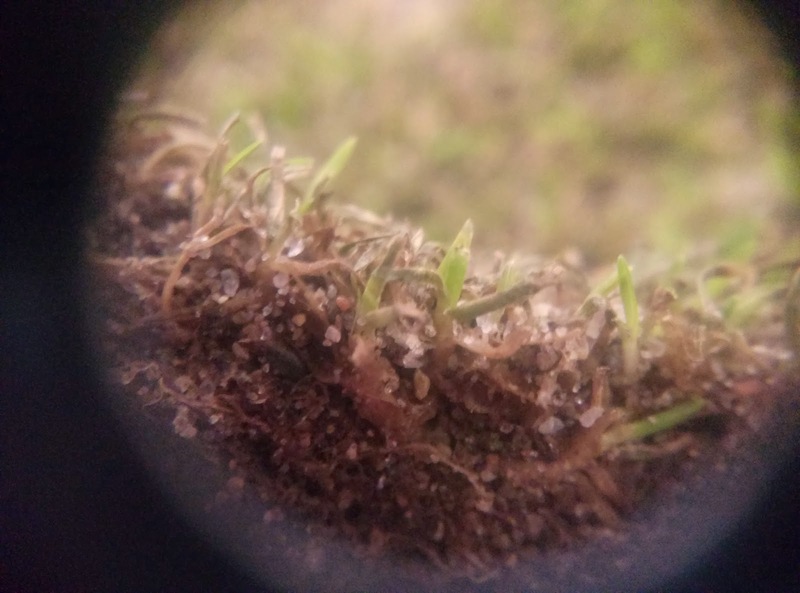 These extra holes create three advantages: additional channels for spring root growth, aid in relieving any deeper compaction within the rootzone soil profile, and extra drainage capabilities for ice/snow melt to prevent ice formation on the plant surfaces. As the picture shows, having these holes open going into winter were instrumental in our success last winter limiting damage on greens from a potential catastrophe. Fertility. 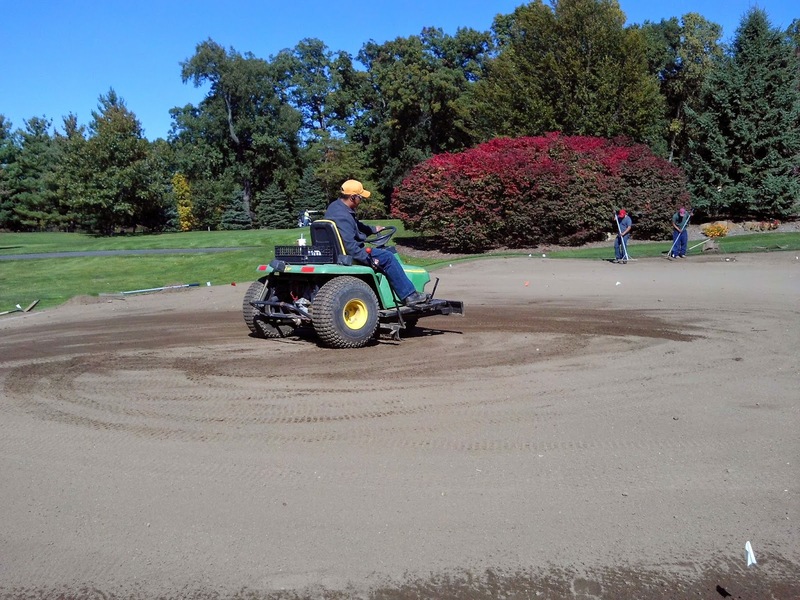 While we limit nutrients on finely maintained turf during the season to provide great playing conditions, the fall is the best time to feed the turf to maximize carbohydrate storage going into winter. The more carbs the plant stores, the quicker it will break dormancy when temperatures warm up in the spring. So what if the winter of 2014/15 is the same as last year? My plan is much more defined than it was when I started here, with as much research and real world experience I gained from my first few weeks here at Elcona. 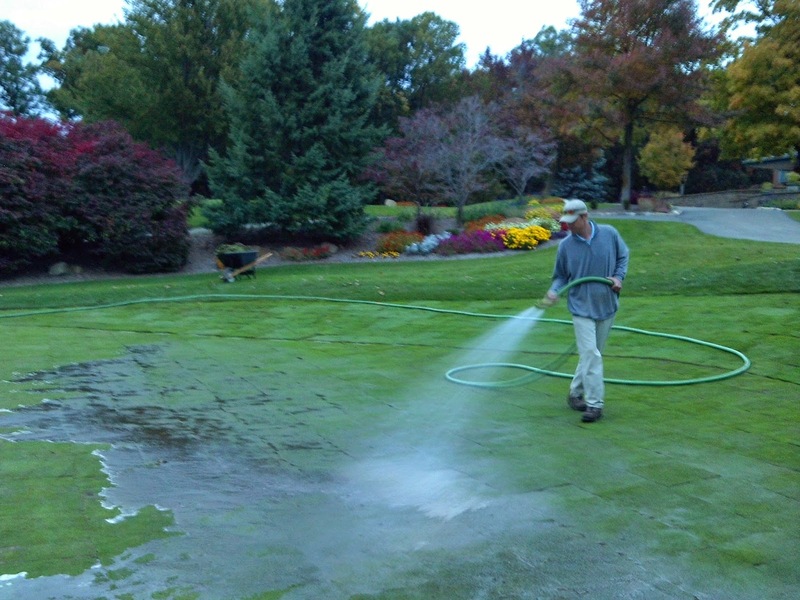 We know our process for snow and ice removal should it become necessary, and we know that the most important practice is to constantly monitor the green for melting after removal, to prevent any crown hydration injury from water re-freezing. If any significant ice layers form, we will implement our removal program if the layer is still present after 30 days of formation. This gives us plenty of time before the 45 day threshold is reached and toxic gas levels start to become detrimental to the Poa. My apologies for such a long post, but I wanted to clearly outline our plan going into winter for the greens, to prepare them the best we can for whatever Mother Nature throws our way. Seams filled with topdressing, starting to heal in! 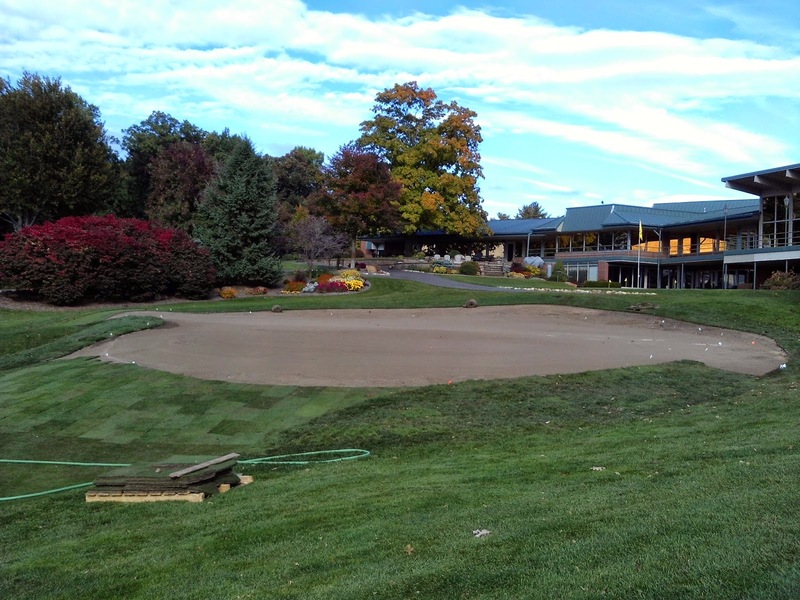 As I have mentioned in a previous post, there is much work to do on 18 green before the snow starts flying. 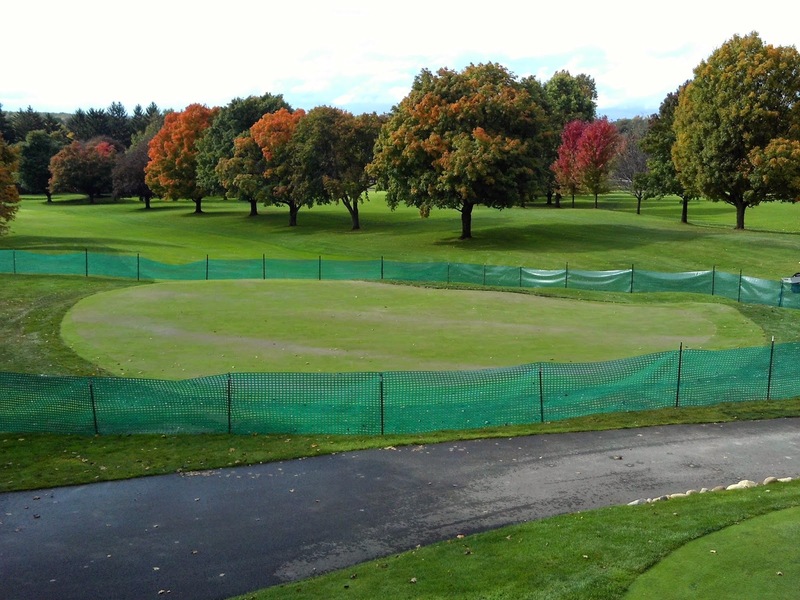 What we do this fall has a profound impact on how early the green can open next spring. 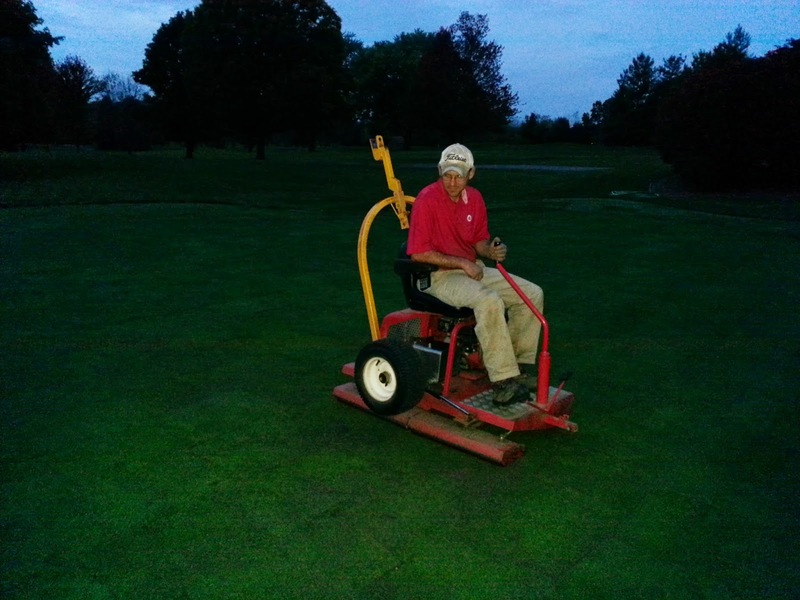 We have rolled and top-dressed regularly to smooth the putting surface and fill in the seams. 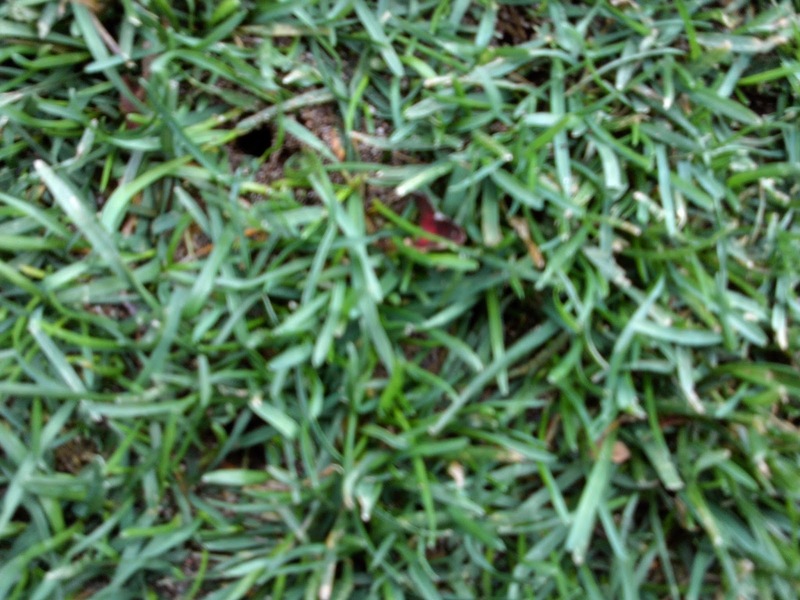 Depending on growth rates and how successful we are at smoothing the surface, we may mow the turf at a much higher height than normal to keep the plant growth from getting out of hand. 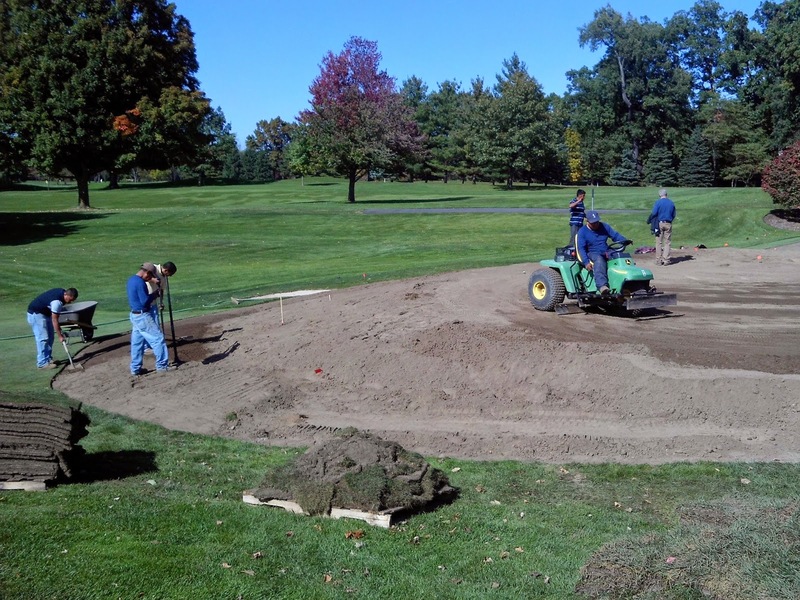 Fertilizer and other soil amendments were added before laying the sod to give it the nutrients it needs to root into the profile and heal in the seams. An couple additional applications will be necessary to further help the plants maximize their carbohydrate reserves going into the winter. 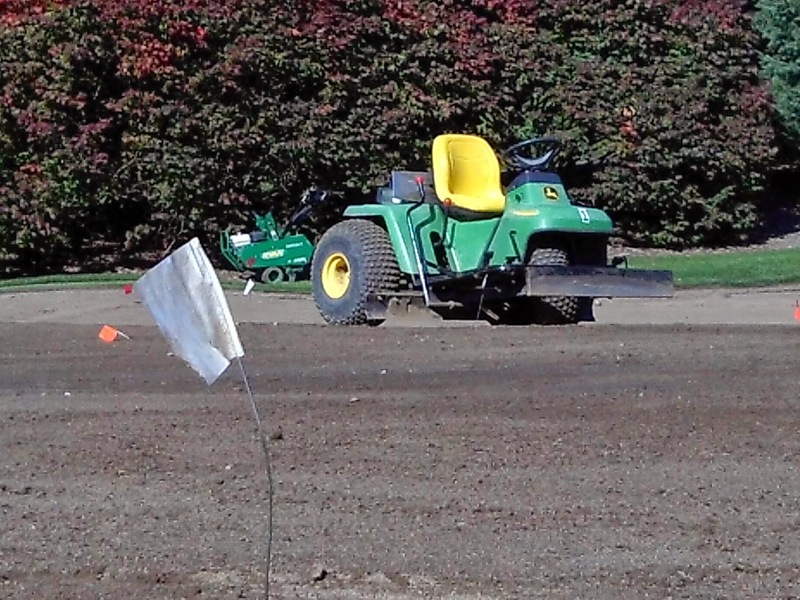 Finally, I would like to have a deep tine aerifier poke holes 12″ below the surface to further smooth the surface and create additional channels for new root growth this fall and next spring. 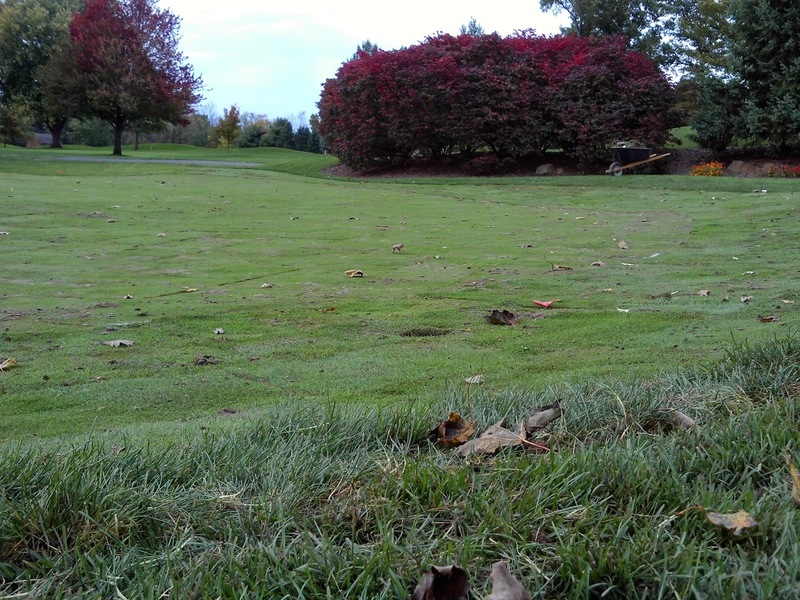 My goal is to have the sod rooted down by November 3rd, when all other greens are deep tined. All in all, the green is healing and smoothing on schedule currently, and will only get better with time. 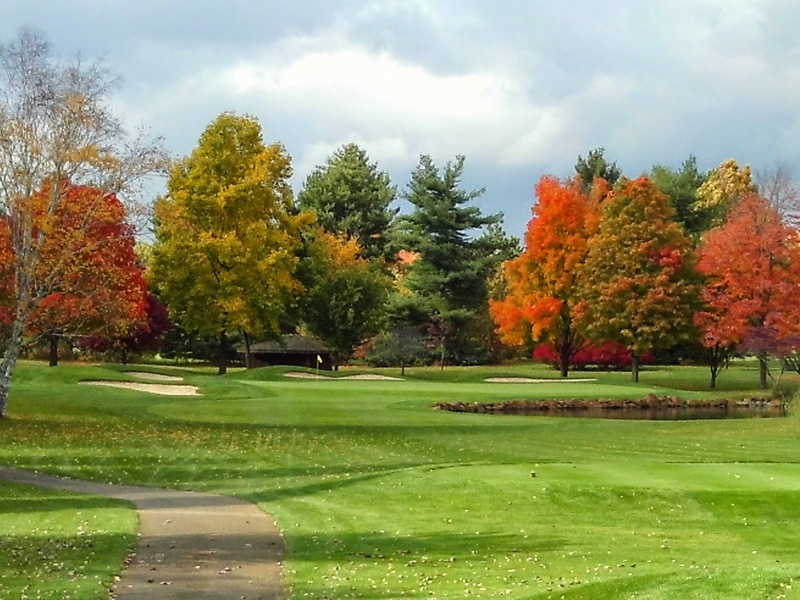 I will have more later on this winter on what we will need to do in the Spring to get the green open for business! Thanks in large part to a joint effort by our crew and Oliphant Golf, we were able to get all of the sod back onto 18 green and finish the project. The rains overnight and at lunch time were a bit of a hindrance, but it was also nice to see that the green drains water the way we want it to (back to front). 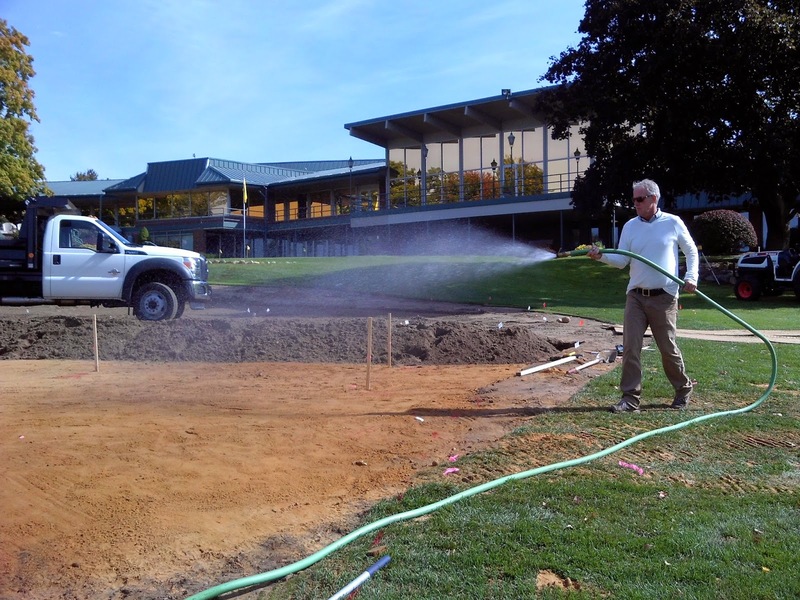 Soil amendments were applied first thing in the morning, before sod was laid. 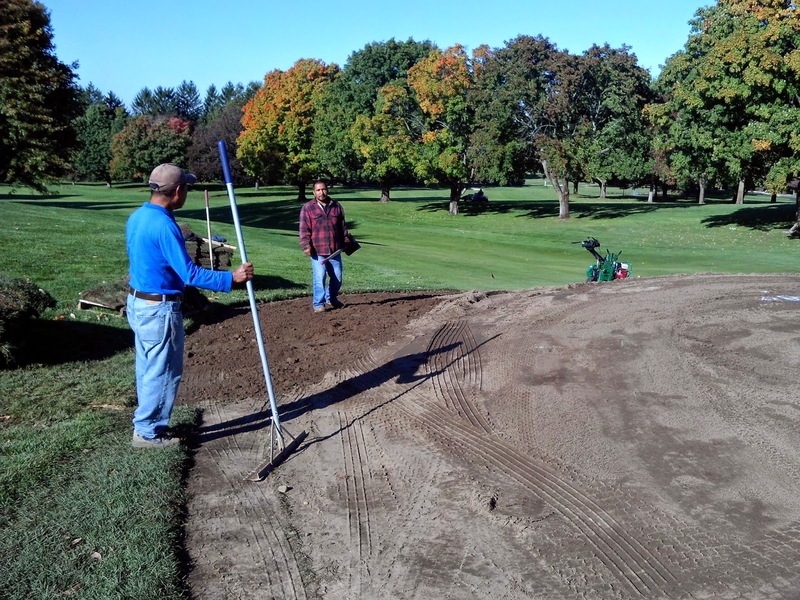 These amendments serve two functions: aid in the rooting of the replaced sod, and help enrich the soil below for the long term health of the green. 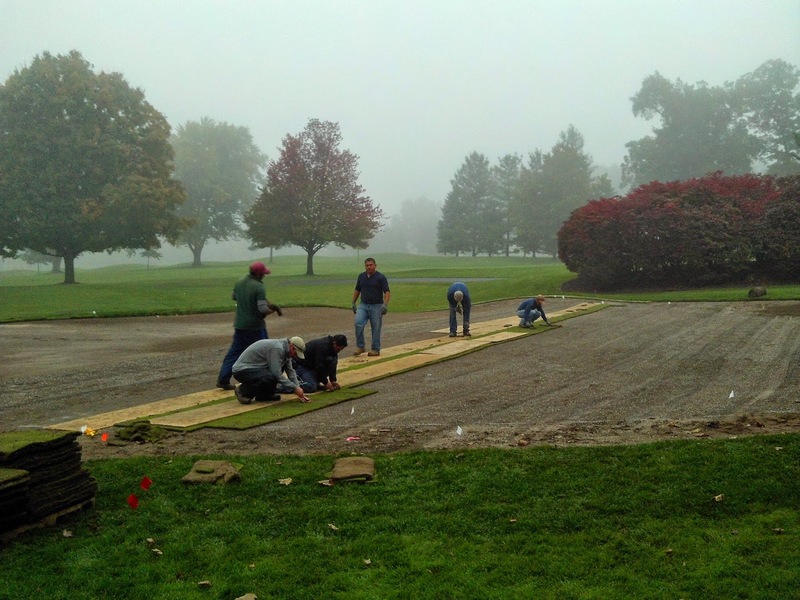 The green sod was then laid from the middle to the back, and then middle to front. 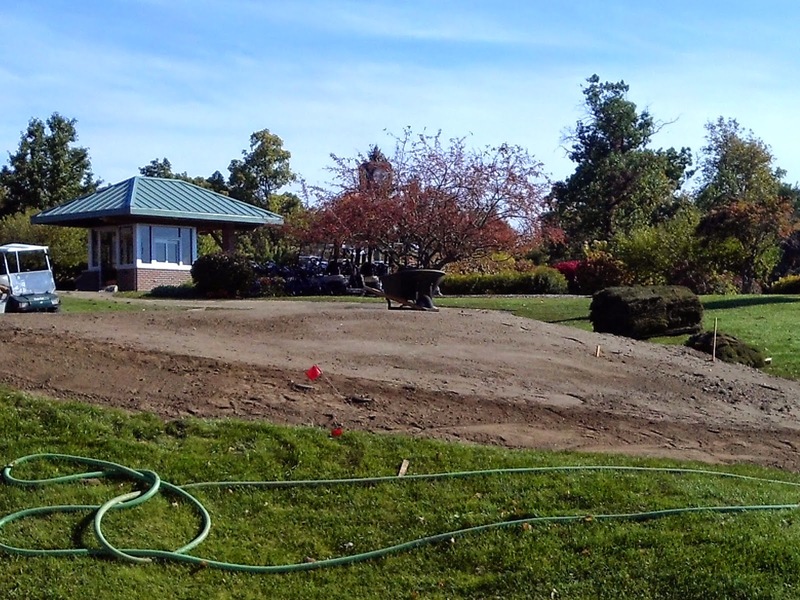 We did have to cut into our green nursery sod for the false front, which is another great reason to have that on hand! By twilight, we were able to roll the green for the first time. This project turned out great in my opinion. There are great little subtleties throughout the putting surface and plenty more pin locations. Today we will be cleaning up the jobsite and placing a fence around the area. The reasoning is simple for fencing: excess foot traffic leads to excess wear and tear. 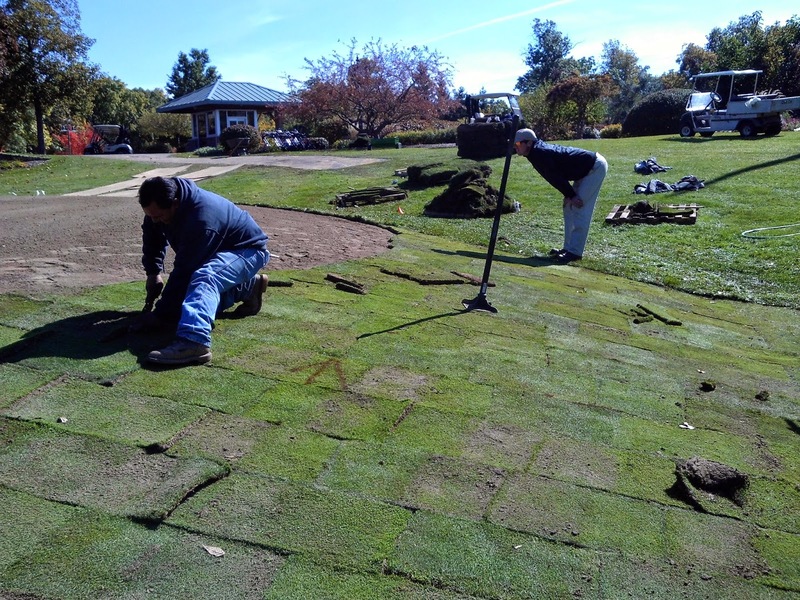 The sod, especially the greens cut, has been under extra stress with its removal and replacement, and needs time to heal in. Please stay outside of the fence. By doing so, it will pay huge dividends come spring time. I will have another post in the next couple of days on the next steps agronomically we will take to get the green ready for play in 2015. 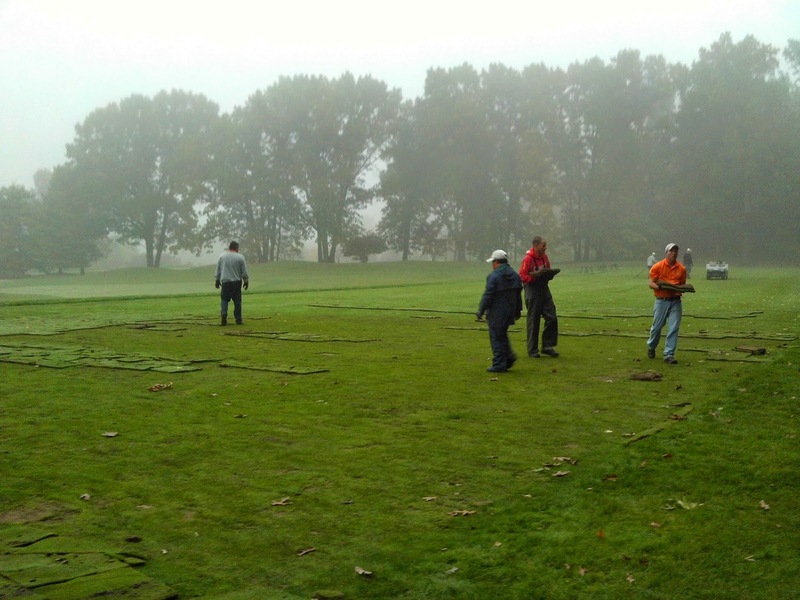 After moving earth for the past 4 days, today was a day where we could visualize the final layout of the new green on 18. 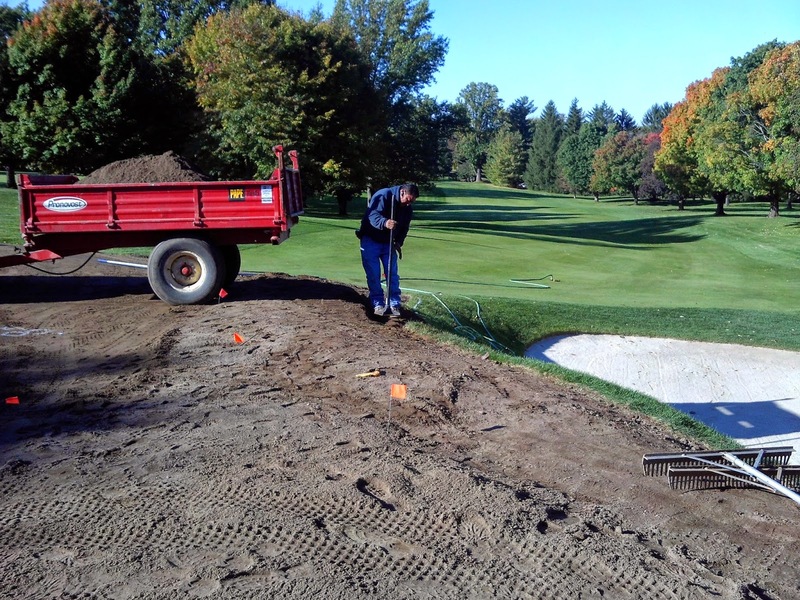 Soil was moved from the transition area in the middle to the crown of the bunker face to raise and contour the area so that water drains to either side of the bunker, not into it. Oliphant’s main shaper worked on fine tuning the middle of the green further to its final grade as well. 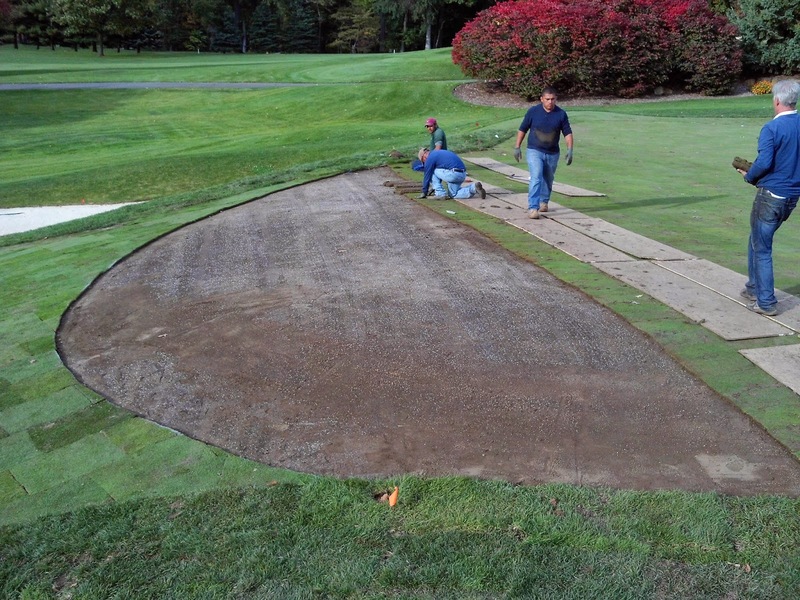 The transition from puttable green, to false front, to approach was completed today also. 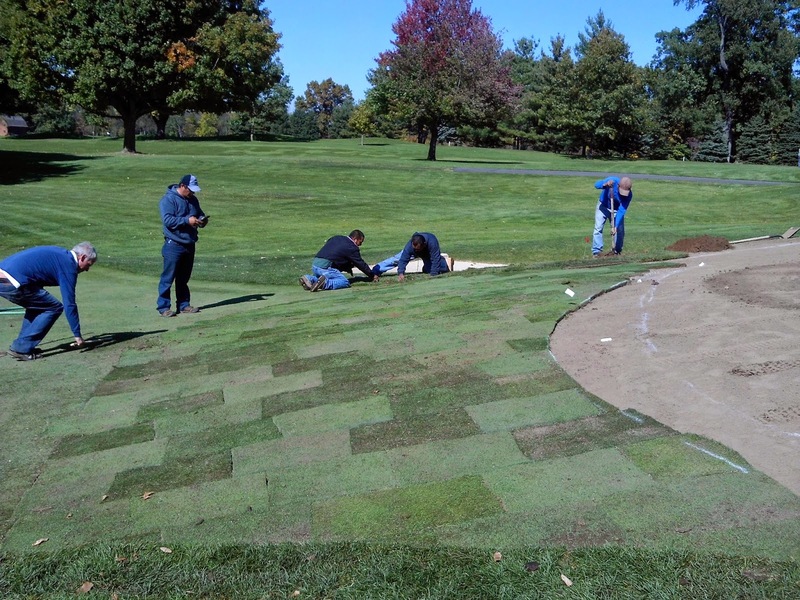 Sod was laid back down onto the new approach and rough surrounds from the front to the middle of the green, after fertilizer and other soil amendments were added. Words cannot express how happy Greg and I are with the crew that is completing this renovation. 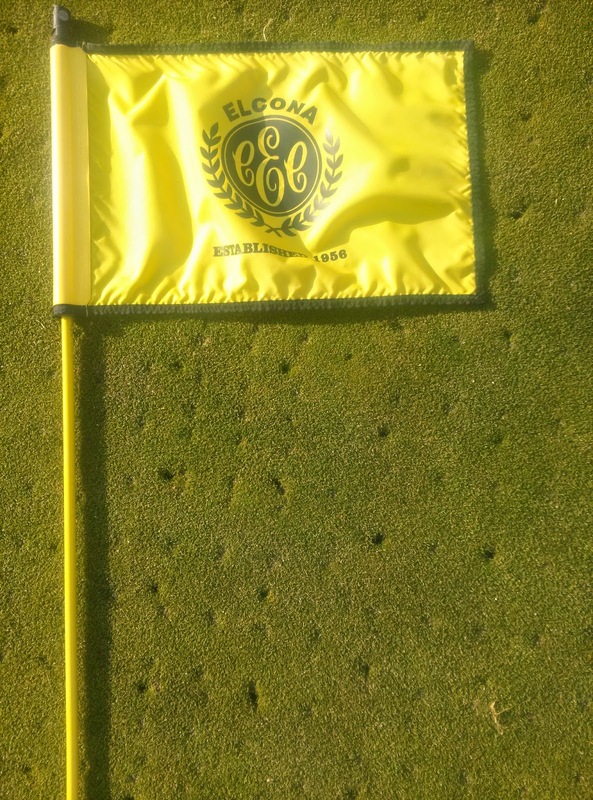 They are highly experienced, efficient, and dedicated to their craft and we are lucky to have them here at Elcona. Hats off to Cam and his crew. If the weather holds together, tomorrow will be full of sod replacement and fine tuning a couple of transition areas mainly where collar and rough surrounds meet. 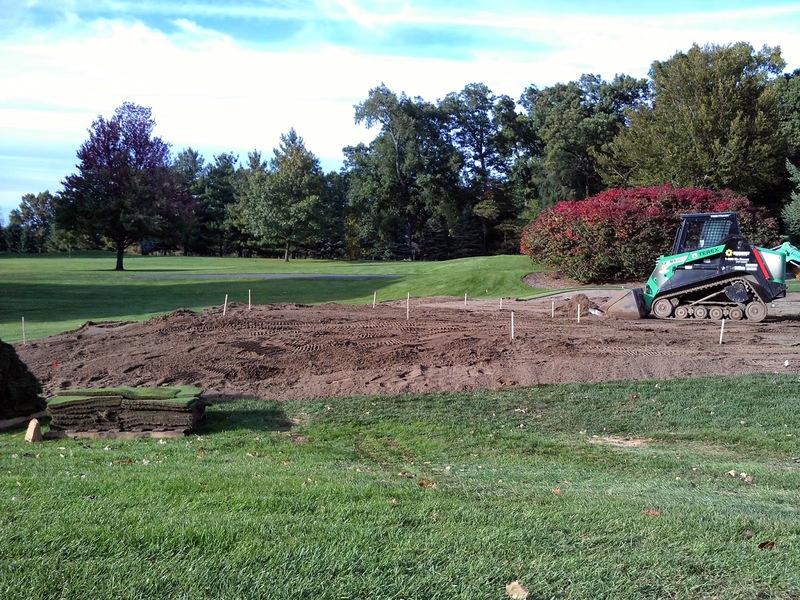 Once all of the higher mowed turf is laid, greens sod will be replaced. We will have as many guys as we can efficiently have complete the job, and the goal is to be complete. Enjoy the pictures, and let’s hope that the heavy rains stay away another day! Completed approach. You can see where the false front will be. Green after Day 5. Starting to really come together! 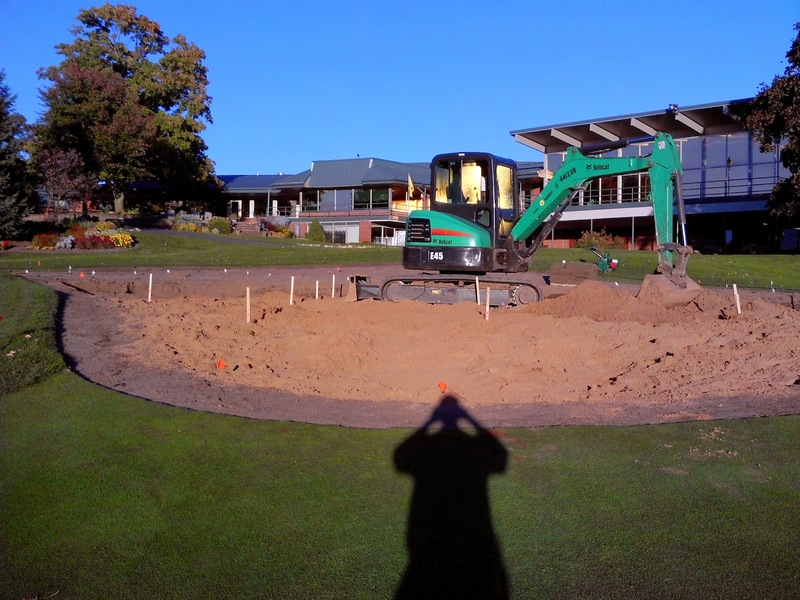 On 18 green today, the rootzone on the upper level was tilled to break up any compaction layer that had been present, additional sod was removed to begin the final transition from puttable surface to approach, and some final shaping was started at the transition from upper to lower levels. 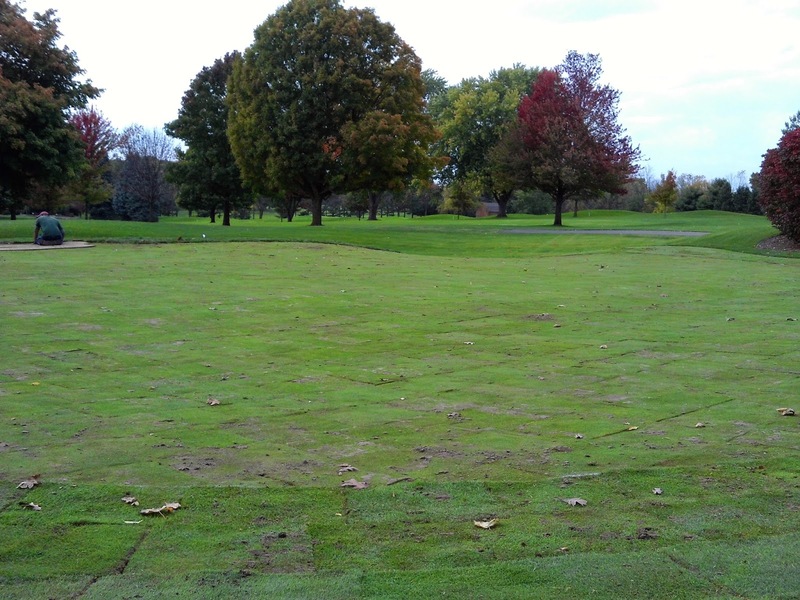 The shaping process started in the back of the green and worked its way forward. Soil was also added around the top of the bunker face to better direct surface water away from the bunker. When you look at the pictures of the front of the green, it may seem like quite the severe slope coming off of the bottom shelf to the approach. Plenty of shaping and final grading still needs to take place, so while we can start to visualize what the new green will look like, it is too soon to have a true idea of the finished product. 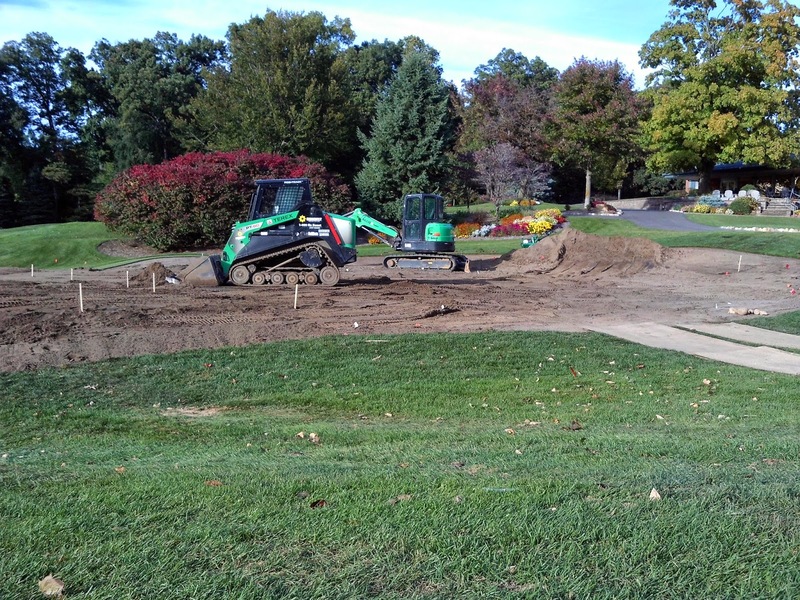 The goal tomorrow is to have the final grading and shaping done and have Shawn Smith give the final approval before sod is laid back down. Front of the new green. More shaping to come. 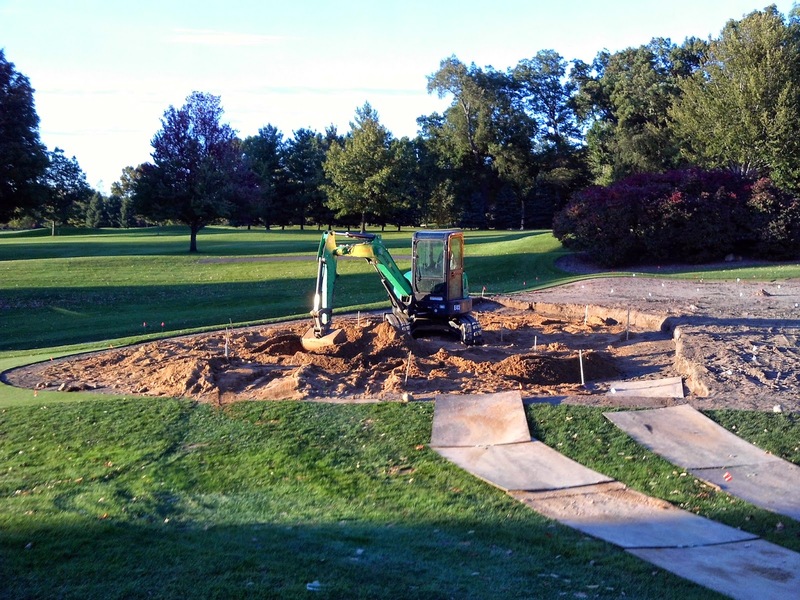 What another great day of weather and progress for the 18 green project. 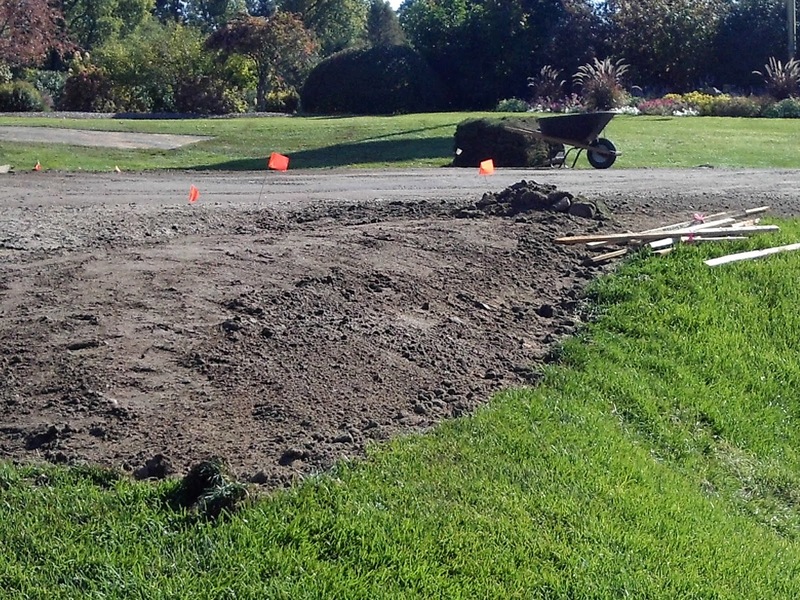 Day 3 brought about finalizing the new front subgrade with native soil, wetting it down a bit, and compacting it down. 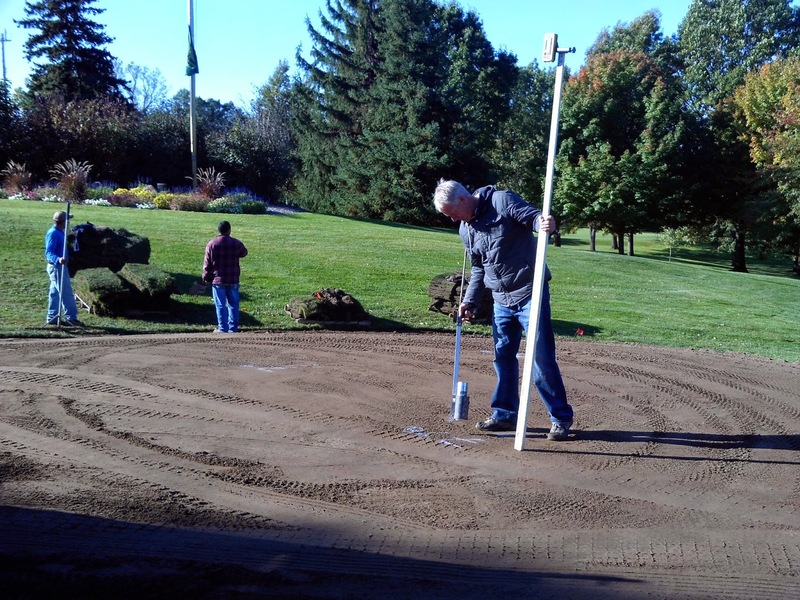 After measuring and marking where the top of the native rootzone will be, it was added back after incorporating additional sand into the mix. 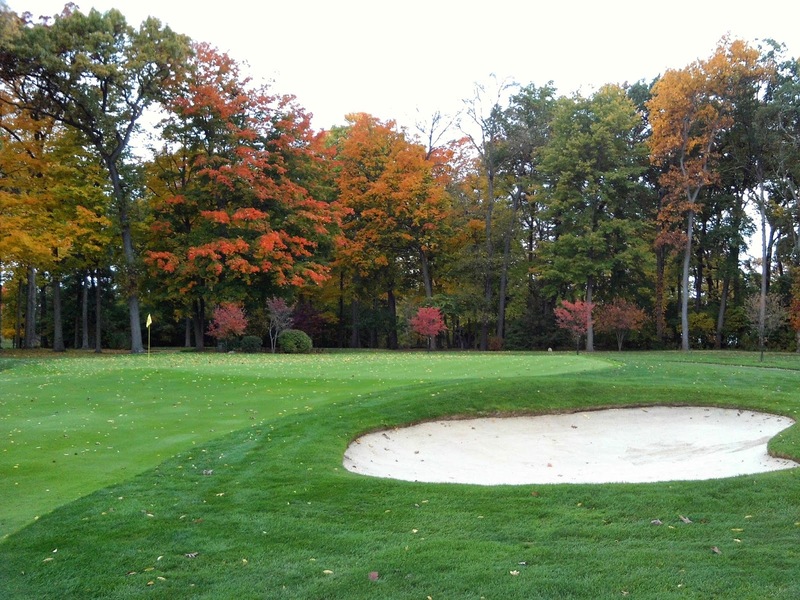 The transition from rough to green was also worked on in the back of the green and the false front. Arthur Hills visited the site today, along with his associate, Shawn Smith. He was quite pleased with the work that Cam, Tracy, and the entire crew from Oliphant Golf has done to carry out his plans to improve our green. 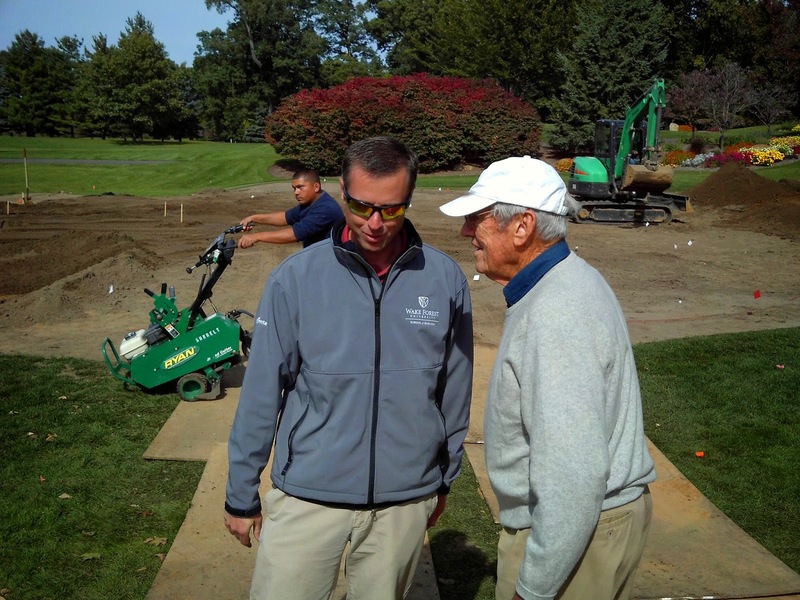 It was great to hear his vision of both the newly designed green and other places out on the golf course. Tomorrow brings another action packed day. We will be rototilling the upper rootzone for final grading and Oliphant will have their shaping equipment out to complete the tie ins and other subtle contours within the rough grade. Final grading may begin as well, if all plans go accordingly. Enjoy the pictures, and I will have another update tomorrow! We had great weather today and made some major progress. 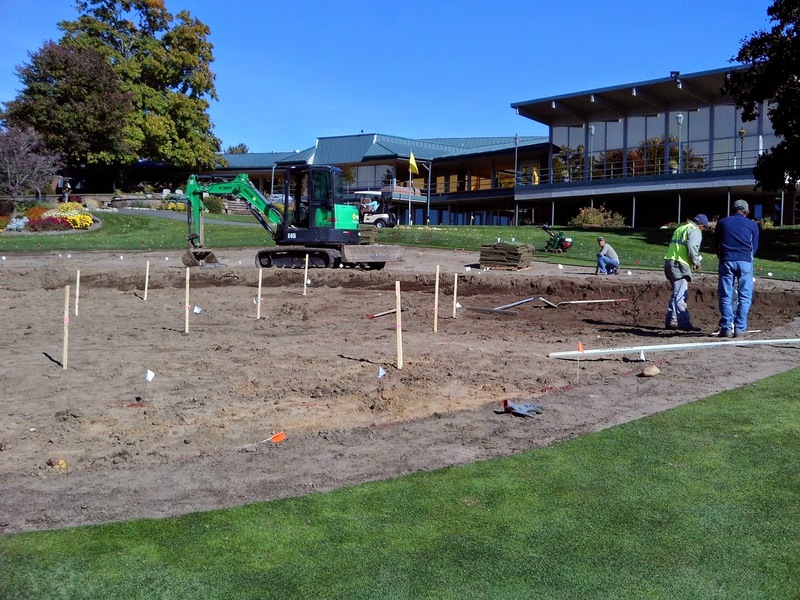 Day 2 of our renovation of 18 green involved staking out measurements for the new lower level, removing the rootzone mix on the lower level, and adding native soil to bring the front of the green to its new subgrade. 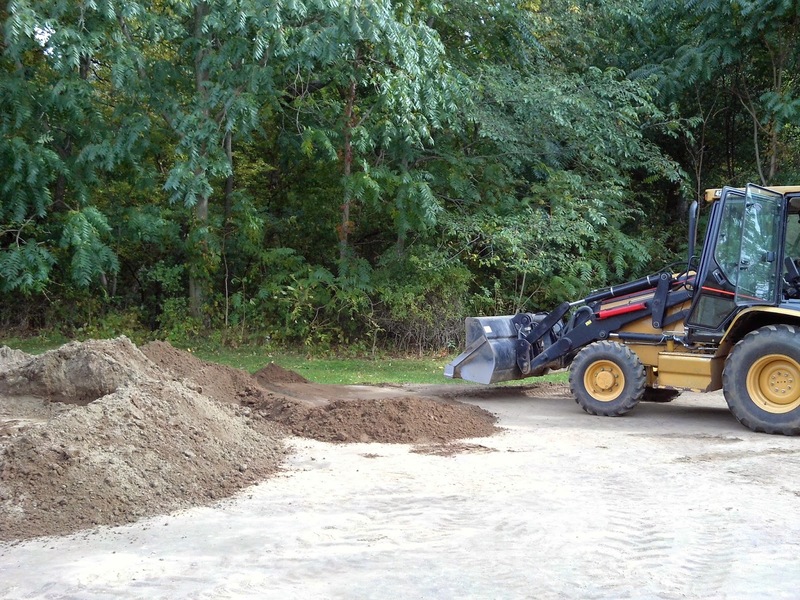 The rootzone mix is being stored near the cart storage barn until we can add it back to the new subgrade. 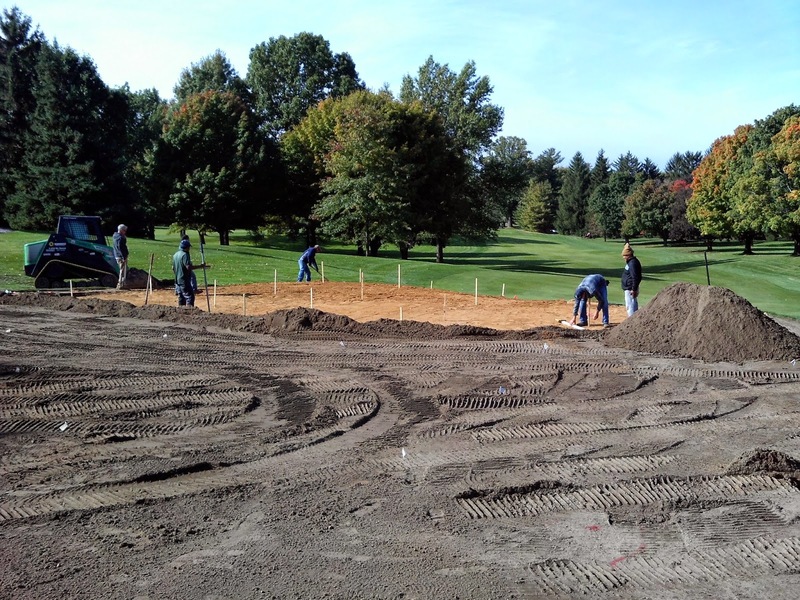 As with saving the existing sod, reusing this soil mix ensures that 18’s rootzone will be consistent with the other 17 greens on the course. 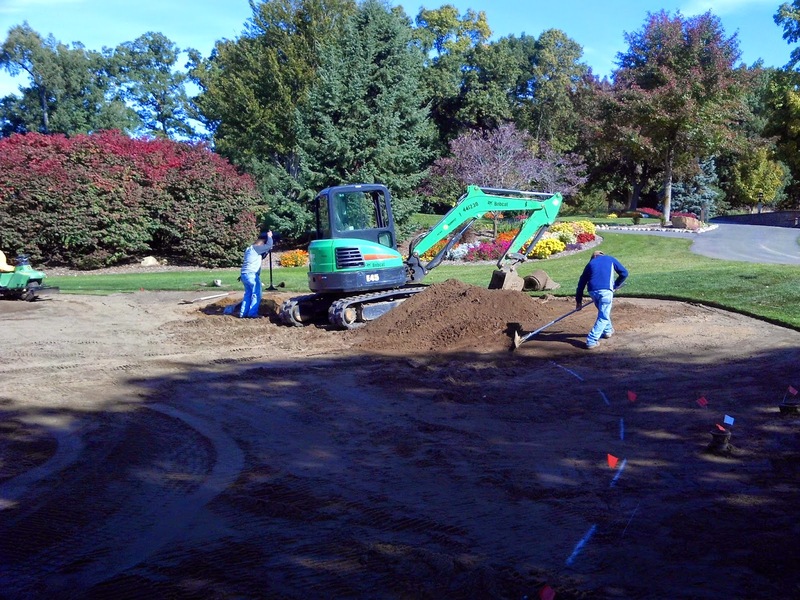 Our plans tomorrow include compacting the new subgrade material to its final measurement and adding the rootzone mix back to the lower level. 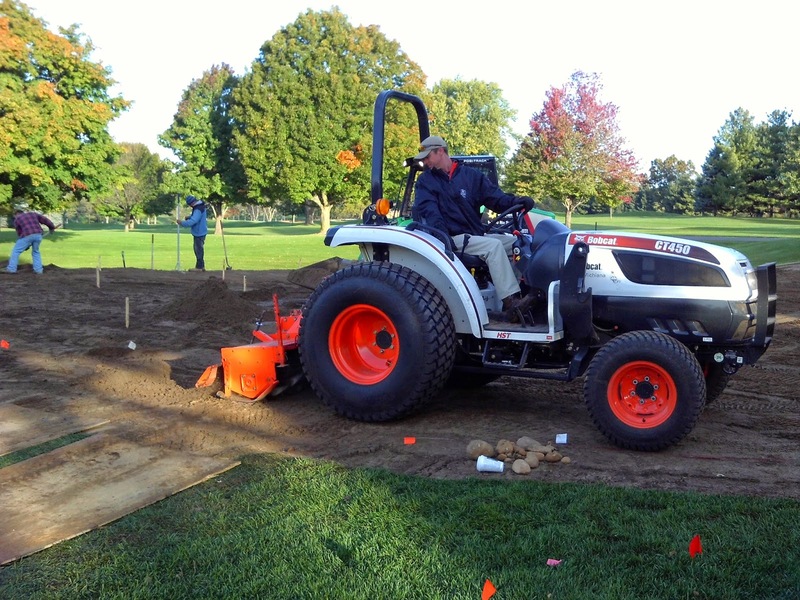 Work will also be done on feathering out the new transitions within the design plans and rototilling the upper rootzone mix to final specifications.